The people in Thunder Bluff sent your letter ahead to me. There’s not really a proper town here, but there’s an outpost where people stop to get supplies. I was pretty surprised to see that I had a letter already when I arrived! So that’s why I took so long to write back, also I had to find someone who had a piece of paper that I could use. Ahali says I’m not allowed to say exactly where we are, which I think is silly because I know you aren’t going to do anything, but he says that other people could read it or something. That’s kind of scary, do you think someone really would? He says the warchief might, but I really think he probably has better things to do that read letters from me. Anyway, I can tell you that it’s near the edge of Ashenvale and there are a lot of feathers around. Naraleth is such a good name! I like it because it has your elf’s name in it, but it also reminds of Narache, which is a good place. I really hope I can see him, I bet he’s so cute. Does he look more like you or like his father? Do you remember that time we were supposed to watch Jalani’s baby and he ended up getting blackberries all over his face and clothes? That happened in like two seconds! I bet Naraleth gets into trouble like that too. I hope that you can visit soon, but I think it’s dangerous right now. I’m kind of scared. I think Ahali is scared too, but he doesn’t want me to know. I figured out that the reason he wanted to come to Ashenvale is because I could go hide in the forest if I need to. Of course there’s a chance that the night elves might shoot me, but hopefully I can remember enough Darnassian words that they wouldn’t right away. The odd thing is that right now the Barrens are more dangerous. It’s true that people are fighting in the Barrens, tauren are helping the leader of the trolls to fight against the orcs who support the new warchief. I don’t really know what it’s about but honestly I like the idea if it means that they’ll leave the night elves and other people alone. We shouldn’t fight. There’s enough trouble out there. I wish I could see your new home, Ahali said Outland is on a totally different planet. That’s so weird. What does it look like there? He’s never been there so he couldn’t tell me what it was like. Are there weird animals and plants? Are there any tauren? I don’t know how long we’ll be here or how long all this will be going on. What if we never go back to our camp? I guess I don’t mind living in the forest again, but it’s different now. My mother is gone, and so are you. I hope I can see you again soon. It’s probably all right to write to me at the outpost here, but you should definitely write in Taurahe and remember they might read it. … strikes again. In Rift there are different kinds of planar rifts in which monsters come out from the various planes (fire, water, earth etc.). 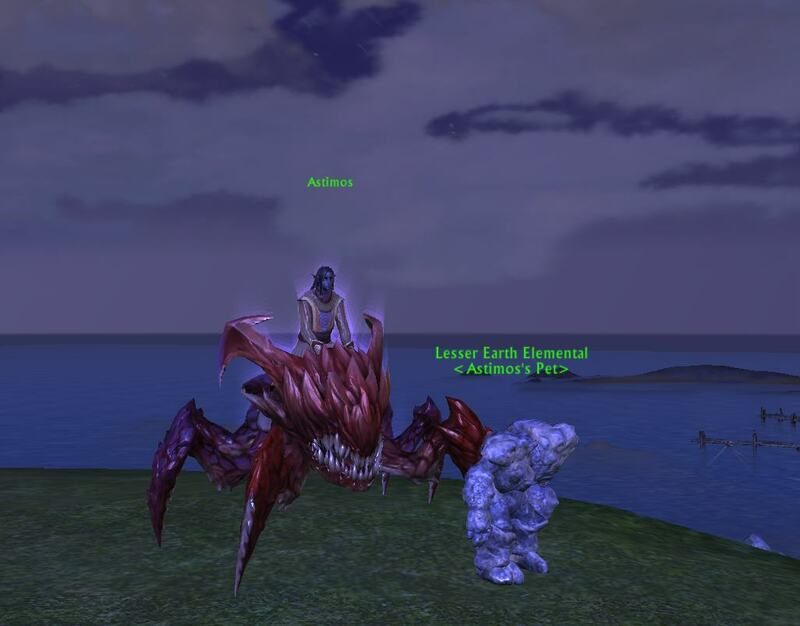 One of the fire rifts spawns these bug guys called Hellbugs, they can drop a pet and/or a mount. I did more than 6 of them on my Cleric and got nothing… so of course my level 9 alt does his first one and gets the mount. I’ll be leaving (way too) early tomorrow morning for a week or so. I am taking my laptop so I should have access to Google Docs and WordPress, assuming there’s wireless. I’ll do my best to get some stuff written but no guarantees! Finding Aranae has proven to be tougher than I thought — I know she has some scout training, but the rain also makes it very difficult to track. Any footprints or bent twigs, even ashes are quickly washed away by the endless rain. Red is worried, she thinks the trolls might have captured her and put her in a stew, I said it was more likely that one of the devilsaurs ate her, but I don’t think she appreciated that at all. Trolls really do eat people in stew, though usually people are smart enough to avoid getting that close to a settlement of trolls. Then again, the trolls here look different from the ones back in the Ghostlands, they probably have different customs and whatnot. I finally found her near nightfall, along one of the beaches. Red had already gone to look for vegetables to add to our dinner, it was my responsibility to find a camp and kill something edible. I found the remains of a small firepit, still black with ash, tucked under a rock overhanging. Looking more closely, I found a little cave that opened back into the rock — its entrance was easy to miss, which is probably why we never saw it before. Sure enough, I found a bedroll and a few folded clothes inside, along with another, larger fire pit. It had to be hers. She was a little further down the beach, trying to spear fish with a stick. Her trouser legs were rolled up at the ends to try to keep them dry, but it hadn’t worked. It also didn’t appear that she had caught anything yet. Clementine ran ahead, probably because she thought there might be fish. It’s funny that a cat from the mountains likes fish so much, I guess she never had it before now. She’s tried it now and knows how good it is. The first thing she asked was what I was doing there, I think that was fairly obvious. I explained that Red had asked me to come with her to search, because Aranae had gone missing from the camp. She was determined not to believe anything I said, even though all of it was true. What reason would I have to lie? She said that probably her parents wrote a letter asking her to go look. There haven’t been any letters as far as I know, and I told her that. She doesn’t think that they would care if she’s missing. That might be true, but it’s more likely that they would be very upset if they learned that she was devoured by a devilsaur while under my supposed care. Then she refused to come back with us because she said I hate her. That’s not true, I don’t hate her. I don’t feel anything about her either way, but I don’t think telling her that would have helped. So why are you looking, she wanted to know. Because she was missing? Whatever I may feel or not feel personally, I don’t want anyone dying out here. Especially someone I’m partly responsible for. I kept trying but she refused to budge. She reminds me a lot of Isandri. I finally gave up and went back up to her cave, I figured that the smell of food might draw her out, the way it does with cats. I know Red is worried and wants to see her. I lit the fire and started boiling the water, and Red came back with her arms full of roots and vegetables, and even a few clams. But still Aranae didn’t show up. It started to rain again, and I thought she’d want to come in and get dry, but she didn’t do that either. Red’s upset with me, she said I should have said something to make Aranae come back. Well I tried that, didn’t I? I think Red would probably have a better chance of convincing her, I don’t think she even believed she was with me. It’s too dark tonight, we’d have no chance of finding her in the wind and rain. Hopefully she’ll still be close by morning. It looks like we won’t be raiding for a while, we lost one of our tanks due to a new job and it’s generally tough to get people during the summer anyway. The thing I really like about raiding is going with my friends and having fun, so I am hoping that flex raids in 5.4 will make it possible again. I’m talking to a friend of mine on another server, and hopefully we’ll be able to all go together. I think that would be really fun! Honestly, I’m not that wild about Throne anyway so I don’t mind taking a few weeks off. It might be a good opportunity to PVP more too, that’s something I’ve been wanting to do but haven’t had time for. I really enjoy druid healing in PVP — much more than PVE currently! Of course I also have my army of alts that I need to level. It’s another double XP weekend in SWTOR, and I’m still having a blast with my characters in Rift. My Cleric is up to 30 now, and I also rolled a Kelari mage. He’s a chloromancer, which is a healing spec that’s thematically a lot like a druid (with plant/spore/vine spells) so I have a feeling I’ll like that a lot. I also have sewing to do this summer! Currently I have a druid plush planned, nothing else so far but I’m sure I can come up with something. I’d like to get a miniature talbuk pattern done, and perhaps a dragonhawk as well. * The mirrors have been working out well. It’s not as good as actually being there, but it’s reassuring to see that she’s all right. She’s even used them to let me know if she’s late, which I appreciate because she often loses track of time. I still worry, but slightly less. I wish she’d find a more suitable voidlord, the one she has can’t possibly protect her. Or she’ll advance enough to be ready to control a fel guard. I haven’t pushed on that point, I cannot allow my personal feelings to over-rule anyone’s safety. I wouldn’t allow another of my students to have one at this point, so I shouldn’t with her either. I know that I am trying to protect her more than I ought, reduce the dangers as much as can be done in this pursuit. Though I know in the end that’s the wrong approach — at least it was before. It’s still difficult to overcome that instinct. I know she can do it, she’s dedicated and comes from a strong background in both fire and shadow magic. It’s only a matter of time. * I do want to include her in my research whenever possible. Aeramin has found the last piece of the shattered soulstone, here in Shadowmoon. It can be no coincidence that they were scattered far and wide across Outland, and not hidden terribly well. Nothing happened when they were combined — nothing dramatic, at any rate. I’m not certain if it’s an empty vessel or whether any residual power remains. Aeramin said it was pulling him in the direction of the draenei temple. I know they are there now, purging it of any fel energy that might remain. Is the stone mistaken, then? What could possibly be left there? And what worries me most, we don’t know who created it, or for what reason. It could very well be a trap, left to lure summoners — I’m sure that’s something that draenei would do. Aeramin believes it might be a call for help, but why make it so difficult to find then? Whoever needed help would be long dead by now. * It’s a very large building, and some parts are in poor repair. There must be another way in. Kestrae suggested that Vallindra might be able to find one, as her work takes her very near the temple. She suggested that Vallindra drop all of her research to help with this, I said she could tell her that. I’m not an idiot. Neither Kestrae nor Aeramin have been married that I am aware of, so they don’t understand that there are things you simply don’t say. Especially to Vallindra. Her work is just as important as ours, much more so to her. She was very eager to help with this part of the plan, I hope her enthusiasm will carry on after we can go inside as well. I know she is not as experienced as the rest of us, but she could observe. Though if it truly is a trap, perhaps I should suggest that she not come. At least then she wouldn’t be involved if something were to happen. * Vallindra believes the guards are on a set schedule, and their shift change might afford us the opportunity we need. She said it would take a week or so to be certain. Good, that allows us time to try and find out who made this thing. I have my doubts whether Aeramin can restrain himself for that long. If he goes alone, I suppose we’ll find out sooner rather than later. I finally convinced Alinash to come out of hiding for drinks. Probably not the safest plan, but it was in a part of town where nobody is going to look too closely at anyone else. I think the only other people there were passed out drunk, anyway. I used to come here a lot, a few years ago. Has it really been that long? I guess it’ll be two years this fall that I got caught up with Rose and the others. I’m not old, but sometimes I feel it, seeing how much things can change in such a short time. The barkeeper I used to know isn’t here anymore, I don’t know what happened to him. Probably better not to ask. Malcos and I used to come and try to pick up girls here, though the girls here weren’t exactly the sort you wanted to pick up. Or they were, but you had to pay. We sat in a dark corner, Alinash with his back against the wall. I guess I can’t blame him. He keeps his ears tucked into his hat, so he just looks like a skinny human and doesn’t draw any attention. It’s a nice hat, I wonder where he got it. Not as nice as mine, but still pretty nice. He explained that he hadn’t come out of hiding because he was still getting over the winter. I kind of thought he was being a bit of a baby about it, but then I remembered that it’s usually pretty warm in Silvermoon. So he’s not used to the cold at all. The first couple of winters I was here were pretty awful too. At least Ironforge stays warm with the forges, and it’s underground so it’s a bit insulated. Rose gave him those scarves and stuff, but I guess it’s not enough when the whole building is frigid. I told him he ought to come stay in the shop next time it gets cold. I didn’t exactly clear that with her yet, but I don’t think she’d mind. I just don’t know where he could stay, though. Pup’s in the old work room and that’s pretty small. Of course if Josie left, he could use that one. She showed up a little while after we did. She followed us. Being a bird gives her an unfair advantage there. She claims no one saw her, she better be right about that. Her mistake could put Alinash in danger, and us for associating with him. I asked her about her boyfriend and she says she hasn’t heard from him. I told you that guy was no good, but does anyone ever listen to me? No. Alinash hadn’t heard anything about Kalimdor at all. We had to tell him what we knew so far. He said he might try to get in touch with some people in Orgrimmar, but I agree that it’s going to be difficult to get any messages in. They’re watching the mail closely, I am certain of that. I haven’t heard from Risarra. I guess I have to admit I’m a little worried, even though I haven’t lived there for years and I hated it there, it’s still my home. And a part of me hopes that she’s okay. Josie suggested that he go down to the docks and see if the dock workers knew anything. I doubt that they do, what are a bunch of humans going to know about what’s going on with the Horde? I tried writing to another elf I know too, but the last I heard he was in Dalaran, and he could be dead. Josie says we could go swimming to cool off in the summer. At first I thought she meant the canals, that’s disgusting. But she meant the little ponds and streams out in the woods, where she and Rose go at night sometimes. I know about that, you don’t have to remind me. He and I will never be one of them, we’ll always be outsiders. I wonder if he knows. I suspect he knows about Josie, he made some joke about her having a tail, but does he know that the others are too? Would he change his mind about staying in the shop if he did? Rose isn’t dangerous — usually. She’s the one who keeps the others from being dangerous. But I was scared at first, too. It’s hard not to be scared when something like that is staring you down. He didn’t want any help getting back. I hope she wasn’t followed.